seems like it's been ages since i posted anything i've created! 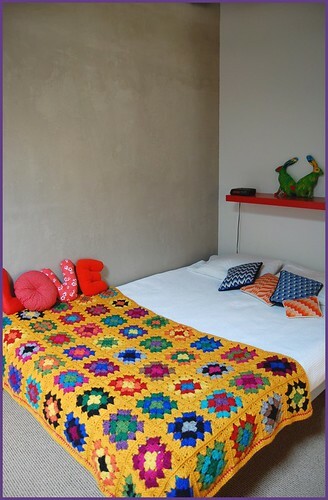 remember the granny square blanket i started way back in june? well, i finished it sometime around the end of august. my memory is a bit hazy as to the exact date of completion, but i'm pretty sure i put it all together sometime right before we moved to our new place. which would mean late august, if my post project calculations are right. i was intending to felt it, but i don't have a top-loader washing machine available (all the ones in our new building are front loaders...shucks!). so i may just leave it be. it's seen here on our bed, which was it's intended destination from the beginning. i am planning on making some pillow-sham type things for some of the pillows and adding a few more bargello pillows, maybe this jonathan adler one. i like how everything else it pretty modern in the area (the bed frame, the quilt, the shelf), with all these hand-wrought touches about. a tried and true to me visual juxtaposition.